Greenall’s has been proudly distilled for over 250 years through the craftsmanship of seven generations of master distillers, the custodians of our secret recipe. 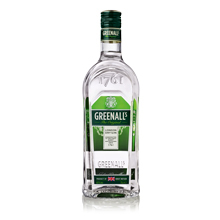 Crafted in UK’s oldest gin distillery, Greenall’s The Original uses the same secret recipe that has been handed down through only 7 master distillers. Best served with ice and lime in a classic G&T or as a versatile cocktail ingredient if you’re feeling a little more adventurous.